When I read the first news report on this I immediately dismissed it as satire and ignored it - it was only after seeing it appear on a few news outlets that I realised that they were serious and the combination of populism and spite for Tony Abbott had led the colossus of the crossbench, coal baron Clive Palmer to join forces with climate crusader Al Gore in the most unlikely alliance I could possibly think of. As a result it seems the Renewable Energy Target, Clean Energy Finance Corporation and Australian Renewable Energy Authority may all survive the government's attempts to kill them off (Clive didn't go so far as to promise to keep the carbon tax though even that looks like outliving the 1 week Tony Abbott promised it would be abolished within) - Al Gore and Clive Palmer: behind the scenes of an unlikely bromance. I also found the conspiracy theory that Malcolm Turnbull engineered this during his dinner with Clive shortly beforehand kind of interesting. The extraordinary Gore-Palmer drama began about 10 weeks ago when the quietly spoken but very effective former Australian Conservation Foundation head, Don Henry, approached a former adviser to Tony Windsor, John Clements, to ask whether he could open a line of communication with Clive Palmer. Henry is an international board member of Gore’s “climate reality project”. Clements and Windsor had struck up a friendly relationship with Palmer during the last parliament. Palmer’s three senators held the key to the future of most of Australia’s existing climate change legislation. It was an unusual, but potentially powerful, mix. Clements was sceptical – was the conservationist just lining up to have a go at Palmer? He was persuaded the dialogue would be serious. Phone calls began, between Henry and Palmer and between Palmer and Gore. Would the Palmer United party (PUP) keep the clean energy finance corporation, the climate change authority, even the emissions trading scheme in a kind of hibernating state in preparation for tougher international action? Just over two weeks ago Ben Oquist, now strategy director at the Australia Institute but previously chief of staff to Greens leaders Bob Brown and Christine Milne and a canny political and parliamentary operator, flew to Brisbane to share a Japanese lunch with Palmer and his media adviser Andrew Crook. 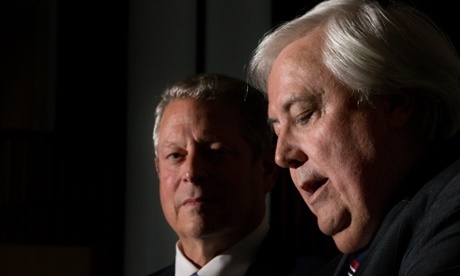 Should he meet Gore, Palmer asked, as the three discussed the details of climate policy. Gore then wavered about the idea of standing at a podium beside the leader of a party that was promising to repeal the world-class carbon pricing scheme. At the last minute he was convinced to go ahead because PUP was promising to reintroduce the scheme in a different form in the near future and had also agreed to retain the renewable energy target, which it had previously intended to try to abolish, and which the government has been preparing to dramatically wind back. The carbon price will almost certainly be repealed. Direct Action is likely to go down as well. But some parts of the current climate change laws will be retained: the CEFC, the independent climate change authority and the RET.